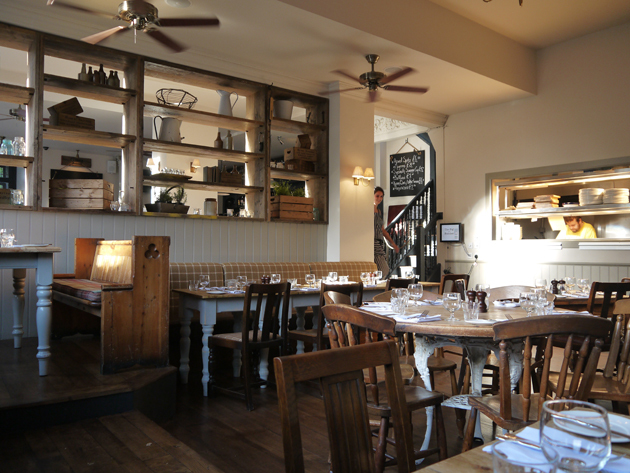 The Pig and Butcher review – a pig’s ear or worth a butcher’s? Yet another Islington gastropub or something more? Islington has no shortage of gastropubs, but The Pig and Butcher caught my attention for two reasons. One, it has a hint of blood thirstiness in its name that is both mildly amusing and quite fitting since there’s apparently an on-site butcher’s room. Two, it comes with The Euro Hedgie’s recommendation which he does not give out willy-nilly. The Pig and Butcher isn’t hard to find. It’s located on Liverpool Road which receives far less foot traffic than Upper Street, but it’s still a popular choice with the moneyed locals so a reservation is almost certainly a good idea. 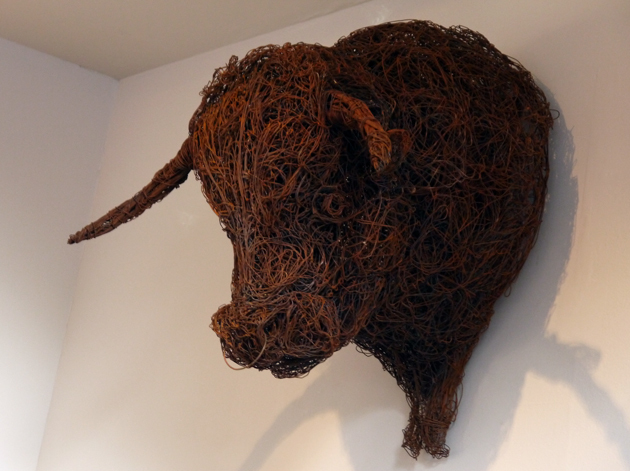 It’s a warm, handsomely decorated place although oddly there’s a wireframe cow’s head mounted on the wall. Given the name, it should surely be a pig’s head but I digress. Service is warm and friendly, although it can suddenly become rather cold as the evening draws to a close. Shouldn’t this be a pig’s head? 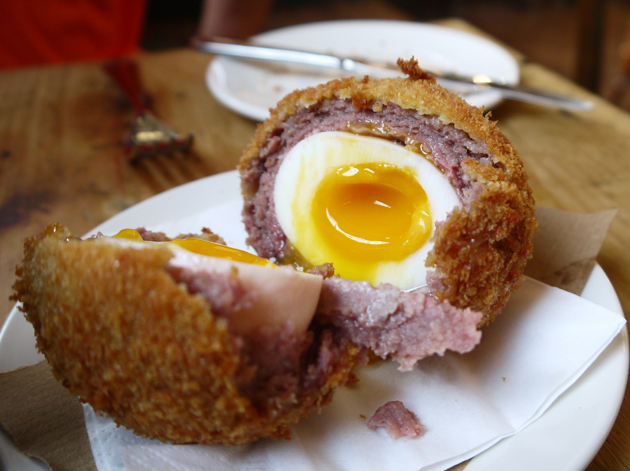 Scotch eggs aren’t often available at The Pig and Butcher and even when they are, you may still have to ask for them specifically as they’re often off the menu (which also changes daily). This was the case when I dropped by on a weekday evening with The Euro Hedgie. The massive ball was easily big enough for the two of us. The smooth, crisp shell easily gave way to a thick layer of smooth, lightly salted pork. In the middle of it all was an egg that had just been cooked with a rich and soft, but not runny, yolk that meshed with the pork wonderfully well. Well worth having. 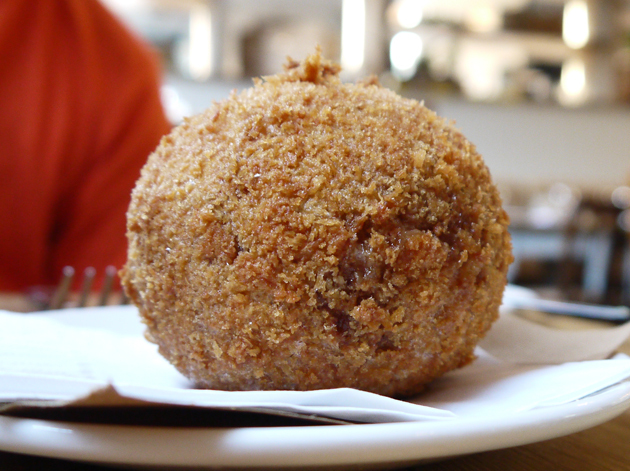 The king of scotch eggs? The Euro Hedgie opted for venison cooked rare as his main course. 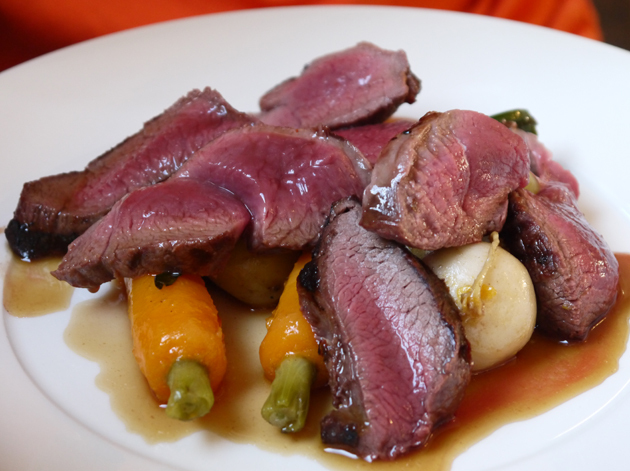 The light yet satisfyingly meaty strips of deer were cooked perfectly with juicy pink centres, but despite the help of the meaty jus it didn’t have quite the same depth of flavour as the best examples of vension. Not bad though, not bad at all. The Hedgie had the same complaint about the duck confit, but I didn’t share them. Both the heavy leg meat and the lighter thigh meat were topped with taut, crisp skin. The meat itself was moist and had a gentle, lip smacking viscosity in places. 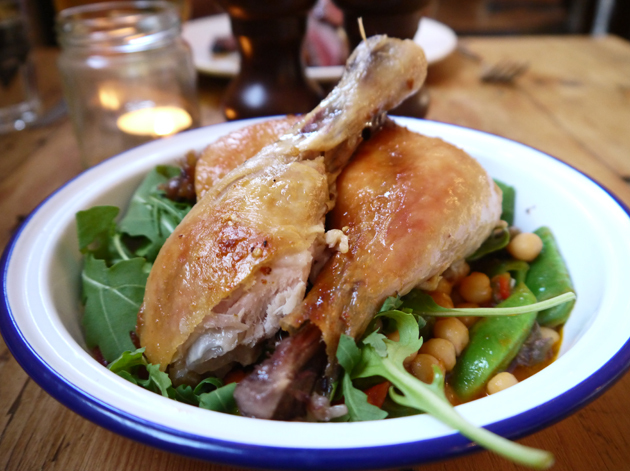 The duck was served on top of a bed of rocket and chickpeas in a tomato-based sauce that was a little out of place, but was pleasingly hearty in its own right. You can tell this meal was in Islington since there are chickpeas present for no apparent reason. That double dosage of meat left little room for dessert, which only reinforced my desire to return for another meal. My return to The Pig and Butcher wasn’t soon enough for my liking and I had to dine without the assistance of The Euro Hedgie. Still, the service was as friendly as ever and the place was very quiet on my Monday evening visit. As a non-drinker I appreciated the orange juice which was actually made from freshly squeezed fruit rather than the horrible, sickly sweet from-concentrate swill served at innumerable other pubs. Risotto is a commonly available dish, but I can’t remember the last time it’s been done this well. The medium-sized grains of rice clumped together and had a slight chewiness to them. The rice also had an incredibly rich, buttery creaminess to it and was both coloured and aromatically flavoured with saffron – the memory of the smell alone makes my mouth water. Even better were the generously-sized fillets of fresh red mullet. As well as being large, the fillets were tender and had their own salty aroma evocative of the seaside. The limp rocket was a slight disappointment, but rarely have I had a dish that’s as satisfying as this and a large part of that has to be attributed to the wonderful aromas. 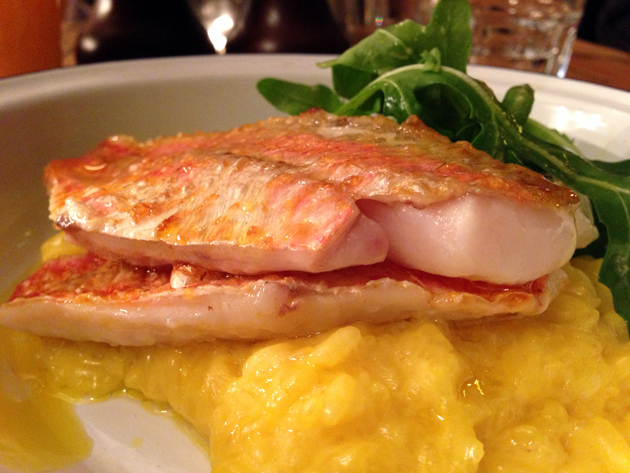 The best red mullet and the best risotto I’ve had in a long, long time. Following such a cracking starter was a tall order, but the Old Spot pork leg was up to it. The slices of pork were gently seared on the outside with smooth, gently tangy white flesh on the inside. That tang was enhanced by the rich, fruity jus. This in turn was complimented well by the black cabbage that was in turns tart and almost fruity in its sweetness. The champ was the perfect hearty accompaniment – cabbage mixed into mashed potatoes which could easily be a meal in of itself when eaten with a generous dollop of dijon mustard. Comfort food at its best. If there was one weak dish of the evening, it was my dessert of mulled blackberry fool served with orange curd and shortbread. The lightly creamy fool was dotted with whole, lightly sweet blackberries. 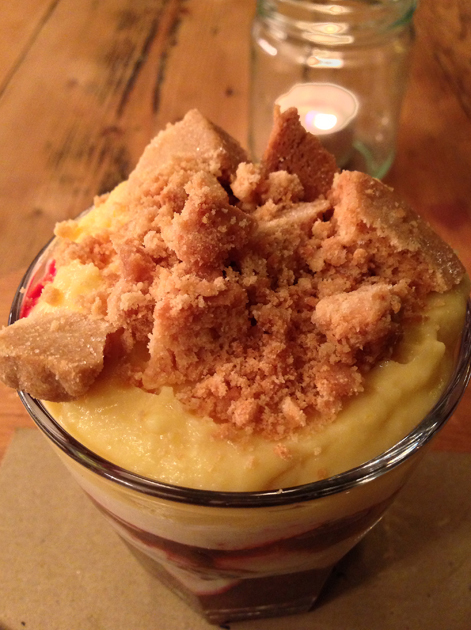 The fool was topped with a lightly zesty, citrusy curd and small chunks of unremarkable shortbread. Although the presence of whole blackberries is welcome, the dessert as a whole seemed a little timid with one layer of wispy, lightly flavoured fluffiness topped by another – the whole thing needed more punch. The Pig and Butcher isn’t the best gastropub I’ve been to in London (that honour still belongs to the Harwood Arms on the other side of town), but it is still damn good. It may not be perfect, with one or two missteps here and there, but I can’t wait to go back. Kitchen Hours: Monday-Wednesday 18.30-22.30, Thursday-Friday noon-15.00 and 18.30-22.30, Saturday noon-16.00 and 18.00-22.30 and Sunday noon-21.00. Total cost for one person: £33 approx. Tags: confit, duck, london, mullet, pig and butcher, pork, restaurant, review, risotto, scotch egg, venison. Bookmark the permalink. 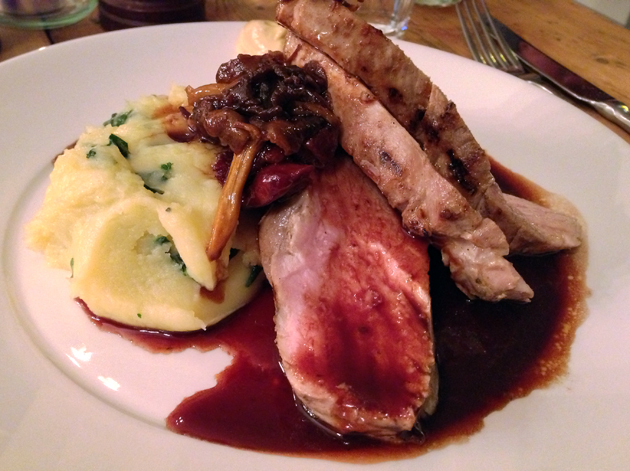 Previous post ← Great Queen Street review – Covent Garden’s best gastropub?